Nearly every week when I zip together my personal laundry bag, I thank the Lord for the lesson He taught me from that zipper. That zipper is an old metal one, in good condition, but as contrary as they come. For weeks I struggled to make it work properly, but it either would not cooperate with my efforts or did so reluctantly. It would zip a few teeth together and stop. No matter how hard I pulled, sometimes it would not go any further. I would move the head back to the start and try again. Often to little or no avail. Getting that zipper to close required a major pushing and pulling effort every week, grating teeth on one side against those of the other. I nearly threw the bag away. Then it occurred to me that perhaps a bit of Vaseline on the teeth might help. Using my little finger, on a few teeth on both sides of the zipper, I dabbed a speck of Vaseline right next to the head. Then I pulled, and presto! The zipper zipped. As if by magic, it went together. I pulled it open just as easily and zipped it shut again, just to be certain I wasn’t dreaming. Sure enough! That zipper was working as it was designed to work, smoothly and efficiently. Then I smiled, for the Lord made me see those contrary zipper teeth as a collection of believers, the head as the leader, and the Vaseline as the oil of the Holy Spirit. 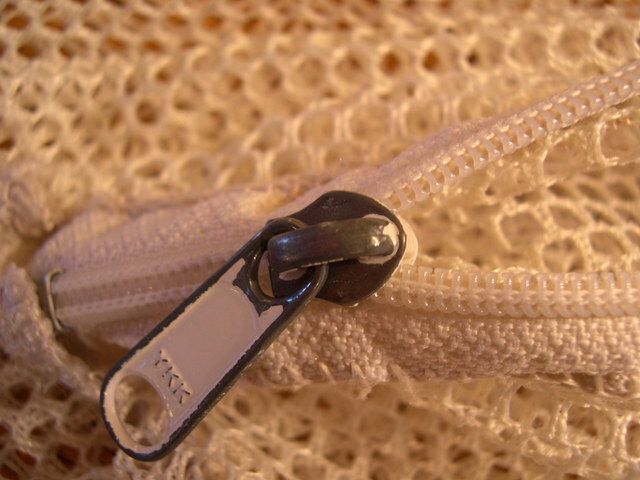 Though the leader may be doing a commendable job of leading (as the zipper head was doing a commendable job of trying to zip), and though the believers may be designed to work together (as the teeth were designed to zip together), without the Holy Spirit, only unpleasant pushing, pulling, and grating will get the work accomplished. But with His presence, with His filling of each one involved, the work goes smoothly and quickly. Perhaps Zechariah said it best when he wrote: “. . . not by might, nor by power, but by My Spirit, says the Lord . . .” (Zech. 4:6 NKJV); or to paraphrase it: “By My Spirit, those believers zip together and do My work!” — by Mrs. R. A. (Carolyn) Peak. Reprinted from the Brethren Missionary Herald magazine, January 1980. This first appeared in the Fall issue of GraceConnect magazine, the publication for the people of the Fellowship of Grace Brethren Churches. A downloadable pdf version of this issue is available by clicking here. It also may be read online at issuu.com. If you would like to receive the magazine delivered to you at no charge via U.S. Mail, click here to subscribe.